Steiff Bingo Monkey Musical Toy with Rustling Foil is hand made in the finest light brown cuddly soft plush. The 23 cm tall Bingo monkey musical toy with rustling foil is a super gift idea for a birth, baptism and many other occasions. Tugging at his little curled tail makes a rustling sound; moving the monkey makes him start playing music. This little monkey has bean bags in his arms, feet and bottom. His inner ears and the soles of his feet have cream/brown stripes. 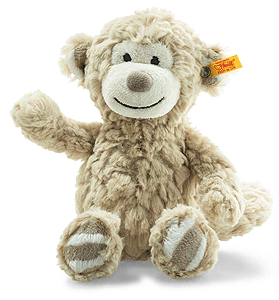 He has a cream-coloured face, brown nose and embroidered black mouth and eyes. Made of light-brown cuddly plush fabric.